i don't know where most of you get your color inspiration, but mine often comes while unloading the dishwasher. i think this combo will make a lovely baby boy quilt. I love aqua with brown! And white. And red too. I can see it, with Tula Pink's Neptune! I have patio cushions those colours with some black added in. I have been wanting to make a quilt using those colours. I would love to see what you do. Totally. I get inspiration from children's illustrations sometimes. oh this would be a great baby boy quilt. Perfect colors for a quilt! I thought I was the only one who looked to dinnerware for color inspiration. ooh, love those bowls! beautiful colors and shape! I love that color combo! I have the same experience with my dishes. Although, I probably need some neutral dishes also. Nice! My dishes are plain (off) white. I thought it would be smart to get neutral dishes so I can use them no matter what kitchen decor I have. Meh - BORING. one of my favorite color combos...or replace the white with off white or light tan. It is funny how we get inspiration. I was driving to work the other day and saw some roses and was totally inspired by them. I think you are right. My color inspiration comes from everywhere and anywhere in the world around me. I always have a hard time coming up with sewing and knitting projects to make for my son... it's far easier when they're younger! those ice cream dishes are great, I especially like the aqua. I love that colour combination! That would look fabulous as a baby quilt! I can't wait to see what you make. Those are my favorite colors! Very pretty! I agree! I have those latte bowls in aqua and orange and everytime I see them together, I want to make a quilt in those colours! I love these colors too. We just finished our basement and these are the colors of our new family room. I can't wait to see what lovely quilt you make from this new inspiration. This so interesting because I also get color inspiration from unloading my dishwasher. Just did a post on my dishes. I love to see what combination serendipitously turns up when I take them out. Neat! I just started a whirligig quilt with those same colors over the weekend. I picked up a great navy blue and white stripe for the backing. I'm doing large-scale whirligigs based on a tutorial for houndstooth blocks from M'liss Hawley's "Fat Quarter Quilts" book. I'm flipping the houndstooth to make the 'gigs. 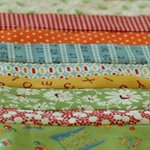 It's a super simple method that has me sewing long strips together and then cutting out the 'gigs. No funny-measuring rectangles required! I've enjoyed reading your blog over the last month -- my thanks for sharing your creativity! 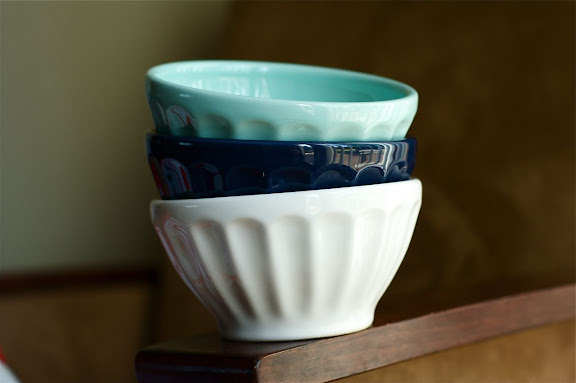 The picture of the bowls caught my eye because I have the same exact ones - in those colors as well as about 8 more. My husband always makes fun of me b/c every time I unload the dishwasher, I arrange the bowls in color combinations for inspiration as well. Gee, I just look to fabric for my inspiration. I need to open my eyes! I've had navy on my mind lately too.